Christopher Clay alerts us to the latest Google Derangement Syndrome from an EU Bureaucrat. Last year, we noted that various EU politicians kept insisting that all of the complaints about their awful plan were due to Google lobbying and astroturfing -- when the reality showed that nearly all of the lobbying came from legacy copyright players. 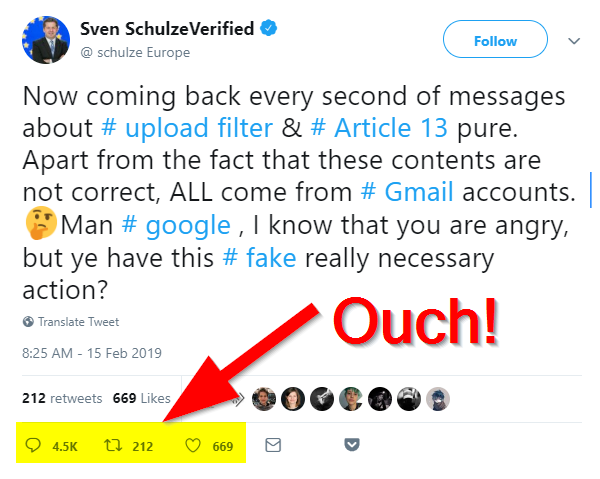 Now coming back every second of messages about # upload filter & # Article 13 pure. Apart from the fact that these contents are not correct, ALL come from # Gmail accounts. 🤔Man # google , I know that you are angry, but ye have this # fake really necessary action? Really now? Perhaps Schultze is unaware that (as of the most recent public stats), Gmail is used by 1.5 billion people. These days, it's pretty typical for lots and lots of people to use Gmail as their personal (and often professional) email address. To claim that seeing Gmail emails proves Google is astroturfing is... nutty. And, it would appear that Schulze's followers recognize just how idiotic this looks. How do you say ratioed in German? And many of those 4.5 thousand replies are ruthlessly mocking him for being completely clueless. I'm guessing he'll blame Google for all those replies as well? It seems you are off your meds again. Either that or you really do need meds.